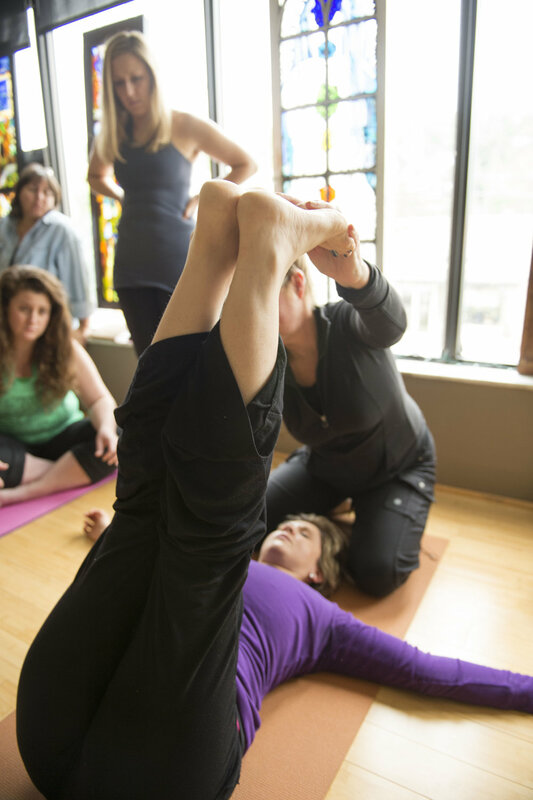 This 200-hour program is composed of 10 intensive weekends, weekly classes, observing, assisting, practice teaching, and mentoring with EmbodiYoga® Teachers. The program is designed to give you time for learning, integration, practice, and application in a yoga studio environment and community. The immersive curriculum interweaves: Embodied anatomy, yoga philosophy and theoretical foundations, principles of somatic leaning and teaching, functional alignment, safe foundational sequencing, asana, breath, and meditation. Students will learn to actively grow their practice from within, finding structure and integrity by opening deeper layers of kinesthetic awareness. While shedding new light on the inner workings of the asana, this approach offers an embodied exploration of the transformative and creative potential of the yoga form. This training is a fresh start for teachers who already have completed a 200/300 hour training and wish to study yoga from a somatic lens, it is also an appropriate training for first time yoga training students seeking a teaching foundation for a deeply informed yoga practice & approach for all types of students. Recommended for anyone interested in body-mind approaches to movement, mindfulness, as well as somatic movement education. Support individual evolution by giving you the tools to live in a creative, authentic and life nurturing way. Encourage you to move beyond a formulaic approach to performing asana in order to understand the more subtle and deeply transformative aspects. Help you relate effectively to multiple students seeking yoga as a source of study and wellness. Challenge you to perceive the essence of each posture from different body systems, developing and expanding consciousness into all tissues of the body. Provide the clarity and insight of EmbodiYoga® to find awareness, ease and fullness in your practice and teaching. You will be contacted to schedule an interview with Program Director Mary Borton where all aspects of the program will be addressed. All inclusive of 10 weekends, October master weekend with founder Lisa Clark, course notebook, required classes. Payment plans are available. Please contact Program Director Mary Borton with any questions you have. We are a school that meets the Yoga Alliance requirements for the 200-300-500 hour level registry.